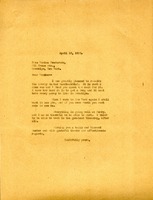 Grable responds to Berry's request that she write in confidence about Monica Henderson. 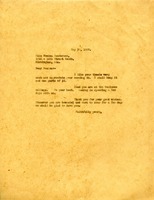 Grable does not know Henderson, but was given the enclosed address and information about her by Annie Laurie Crain. 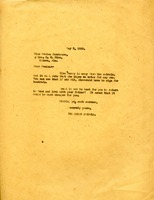 Martha Berry asks Katharine Lee Grable to write to her in confidence about Monica Henderson and asks when Grable will be able to visit Berry. 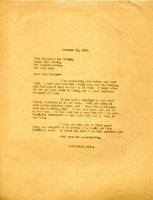 Berry thanks Henderson for sending her thesis, saying that she plans to use parts of it. She invites Henderson to visit whenever she is homesick. 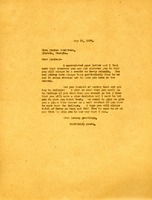 Henderson apologizes for having asked that Martha Berry sign a note for her. She does not plan to return to live in Rome, but will see Bonner at the next commencement. 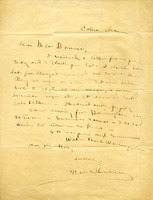 Henderson is informed that Martha Berry is unable to sign notes for anyone. The author suggests that it will be more economical for Henderson return to Rome and live with her father. 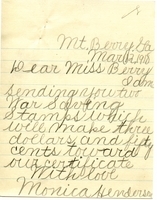 Henderson writes to Berry because she sent two war saving stamps toward a certificate.